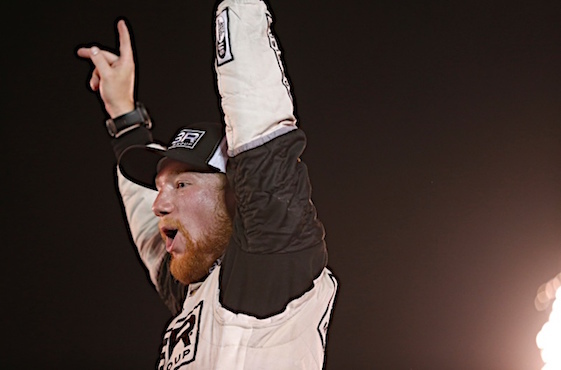 Tyler Reddick, a non-playoff driver, won the first Xfinity Series playoffs race Saturday evening at Kentucky Speedway. The Chip Ganassi Racing driver won with a 14.540-second margin of victory over teammate Brennan Poole. “I don’t know if it was necessarily me making a statement, it was just Chip Ganassi Racing making a statement,” said Reddick, who is racing a partial schedule in the series. “Me and Brennan (Poole) were really fast all night. Poole earned a career-best finish behind Reddick. (5) Tyler Reddick, Chevrolet, 200. (8) Brennan Poole (P), Chevrolet, 200. (2) Ryan Preece, Toyota, 200. (3) Cole Custer # (P), Ford, 200. (7) Daniel Hemric # (P), Chevrolet, 200. (10) Brian Scott, Chevrolet, 200. (9) Matt Tifft # (P), Toyota, 200. (13) Ryan Reed (P), Ford, 199. (11) Ben Kennedy #, Chevrolet, 199. (1) Kyle Benjamin, Toyota, 199. (14) Brandon Jones, Chevrolet, 199. (16) Brendan Gaughan (P), Chevrolet, 199. (19) Spencer Gallagher Jr. #, Chevrolet, 199. (18) Michael Annett (P), Chevrolet, 199. (17) Blake Koch (P), Chevrolet, 198. (12) William Byron # (P), Chevrolet, 198. (22) JJ Yeley, Toyota, 198. (20) Ryan Sieg, Chevrolet, 198. (21) Ross Chastain, Chevrolet, 198. (25) Jeremy Clements (P), Chevrolet, 198. (24) Dakoda Armstrong, Toyota, 196. (26) Garrett Smithley, Chevrolet, 196. (32) Josh Williams, Chevrolet, 196. (29) Quin Houff, Chevrolet, 196. (23) BJ McLeod, Chevrolet, 194. (28) David Starr, Chevrolet, 194. (34) Joey Gase, Chevrolet, 193. (15) Sam Hornish Jr., Ford, 191. (35) Angela Ruch, Chevrolet, 190. (31) Korbin Forrister(i), Chevrolet, 188. (40) Mike Harmon, Dodge, Fuel Pump, 65. (39) John Jackson, Chevrolet, Engine, 59. (33) Timmy Hill, Dodge, Overheating, 55. (36) Morgan Shepherd, Chevrolet, Handling, 27. (38) Dexter Bean, Chevrolet, Vibration, 27. (37) Carl Long, Toyota, Engine, 24. (30) Jeff Green, Chevrolet, Vibration, 16. Average Speed of Race Winner: 151.728 mph. Time of Race: 1 Hrs, 58 Mins, 38 Secs. Margin of Victory: 14.540 Seconds. Lap Leaders: K. Benjamin 1-40; C. Custer # (P) 41-48; K. Benjamin 49-51; C. Custer # (P) 52-92; E. Sadler (P) 93-103; R. Preece 104-125; T. Reddick 126-151; K. Benjamin 152-160; T. Reddick 161-200. Leaders Summary (Driver, Times Lead, Laps Led): T. Reddick 2 times for 66 laps; K. Benjamin 3 times for 52 laps; C. Custer # (P) 2 times for 49 laps; R. Preece 1 time for 22 laps; E. Sadler (P) 1 time for 11 laps.